Our lives have been greatly simplified over the past year. It all started with the need I had to deepen our homeschool. By getting rid of unused resources and only keeping the very best materials on our shelves, we've been able to open up so much space in our minds. It's AMAZING. This urge to simplify has begun to trickle into all areas of our life, from how much STUFF we keep out, to the number of activities on our calendar. Meal planning has also been greatly simplified. I've found a tool that helps me store recipes, plan meals, generate shopping lists, and even share recipes with friends. Plan to Eat is my online hub for meal planning - it has simplified this once stressful area for me!. I have quite a catalog of recipes online that I love, and recipes that I want to try. Using the Plan to Eat bookmarklet on my computer I can easily (with the click of button) import a recipe from a website to my Plan to Eat account. If the recipe isn't online, I simply type the recipe into Plan to Eat and it's stored there. This means I have my recipes anywhere I am (because Plan to Eat is mobile friendly and I can view a recipe on my phone!). Here's a little snapshot of just SOME of my main course recipes. You can see the tags, how many times I've planned them, and where they come from. When I sit down each weekend to plan meals, I go into Plan to Eat, search for recipes, and simply add them to my planner. Once the meals are on the planner, the ingredients needed are automatically added onto the Shopping List. You can also manually add any extra items you need. 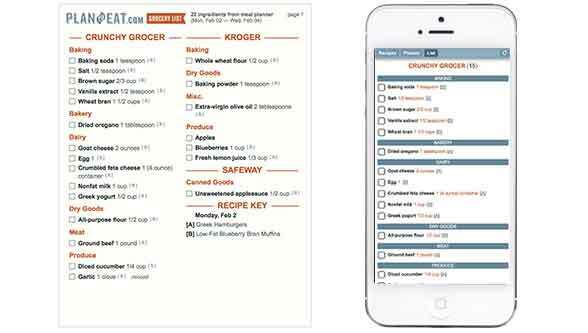 You can either print the list or check off items via your smartphone or tablet while you shop. There's NO MORE forgetting your list at home this way! I have several friends on Plan to Eat. I'm also friends with several blog readers on Plan to Eat. One night last year my Anna came home saying the tacos they had at youth group were great. Well, I know the mom that made the dinner and I know she's on Plan to Eat. I texted her and she said, "It's in my Plan to Eat - Oven Baked Tacos". I went to her profile and saved the recipe to my recipe book. You can sample Plan to Eat FREE for 30 days. If you like it - it's just $5/month or $39/year. It's the BEST $5 I spend each month. It keeps my life SIMPLE, and my family HAPPY.